﻿ Salvador Manor de Legazpi (Philippines) - SAVE ON AGODA! Have a question for Salvador Manor de Legazpi? Well-positioned in Cruzada, Salvador Manor de Legazpi is the ideal point of departure for your excursions in Legazpi. From here, guests can enjoy easy access to all that the lively city has to offer. With its convenient location, the hotel offers easy access to the city's must-see destinations. Take advantage of a wealth of unrivaled services and amenities at this Legazpi hotel. Free Wi-Fi in all rooms, Wi-Fi in public areas, car park, room service, family room are just a few of the facilities that set Salvador Manor de Legazpi apart from other hotels in the city. Guests can choose from 10 rooms, all of which exude an atmosphere of total peace and harmony. Besides, the hotel's host of recreational offerings ensures you have plenty to do during your stay. Salvador Manor de Legazpi is a smart choice for travelers to Legazpi, offering a relaxed and hassle-free stay every time. I would say that this is the worst hotel experience that I had. My expectations were not met at all. I booked the hotel because of the perks it had, (e.g tv/breakfast and the place is near the airport)but it turned out to be ridiculous experience. First, the place was very difficult to find. The hotel did not had any signage, name or tarp. The buildings/houses did not had any numbers plus it was a quiet street. There were only few people outside making it difficult to ask for the hotel. At last I was able to find the hotel after almost an hour roaming around Washington Drive. The hotel did not had any security guard at all. When I went inside, no one was visible. I had to say, "Tao po". Then I saw 2 boys, (I guess they were the inn's helpers). I gave him the Agoda Voucher. He looked at it for about 3-5 minutes. Then he guided me to my room. The room was fine though, I noticed that it does not have TV. He did not hand me the key so I went back to the lobby to ask for the key. I also asked him why there was no TV, he said it was just a standard room. So I went inside the room to take a rest, I checked the bathroom, there were no toiletries at all. That's fine since I have my own. The next day, I know that breakfast was included but I did not expect for anything since I went out of the room several times from 7am-9am as I was also checking for the weather but I did not see anybody outside. Also, I noticed that the room was somehow clean but I was disgusted to see 2 used cotton buds at the bed frame. After 2 days, I then checked out. It was good that I saw one of the boys at the lobby so I handed him the key. I asked him if he needs to check the room before I leave but he said it was fine. So I then headed out. I was thinking that it's good that I double checked the room to make sure I did not leave anything. I would say that overall experience was not satisfactory. 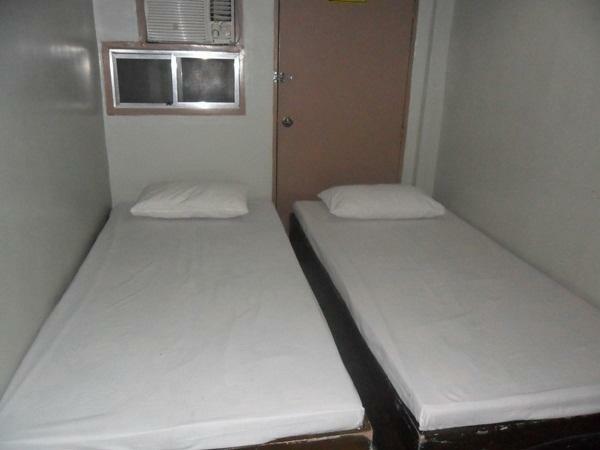 It would have been a good price for a hotel BUT it felt more like a confinement facility Walls had paint chipped off, bed bugs, mosquitos, some man's rubber slippers in the bathroom, no flush. Apparently my room was right next to the kitchen and at about 3 or 4 am, we were awakened by loud laughter of men outside in addition to pots and pans being banged. Absolute Disappointment! There is no hot water, the room and bathroom are poorly maintained. No TV in the room. Affordable, near the airport and easy access to public transport. We booked standard room for family. The hotel looked impressive in pictures but we were so disappointed upon check-in. The room was air-conditioned (the window-type unit was placed directly above and same level with one of the beds) but old and poorly maintained, there was rodent roaming around and mosquitoes fly out from the ceiling. There were 3 single-beds with thin mattresses, and there was no TV. The bathroom tiles were dirty, rusty water came out of the faucet on initial opening, water heater was not working. Wi-fi signal was strong but hotel staff never provided the password. Very poor service; we look for front desk officer to ask for key, my request for mosquito spray was not carried out, hotel guests wait long for breakfast to be served, and hotel staff hardly manage to smile. The hotel was okay. 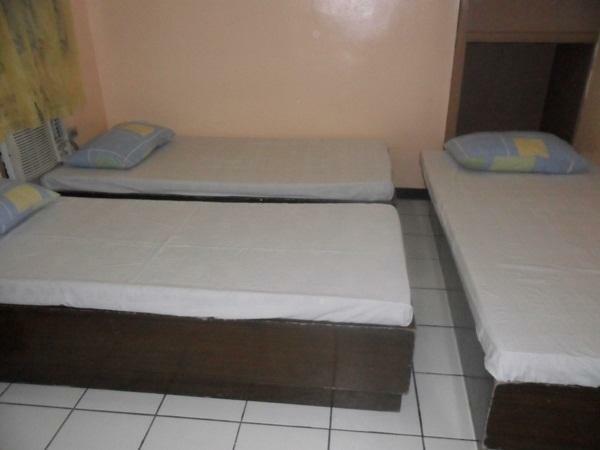 It's not a very luxurious hotel but it's just right for backpackers and those who just need a place to sleep in. I travelled with a colleague and we initially got a room with a queen bed. We requested for 2 single beds and got it just like that. The staff was nice. They easily accommodated our request for late checkin due to our delayed flight. The room was fine, although it was tiny and bare. It had the 2 single beds requested. It had a table and a stool, but barely any room to move. The think I loved was the bathroom. It was also bare, but it was big. It was pretty much the size of half the room. It had a regular shower, no heater, a small sink, the toilet, a pail and dipper. There was a towel rack on the wall, which was still not enough for me. There wasn't any wifi in the room. And there was barely any cellular signal in the room. Overall, the stay was okay. Just right for a place to sleep and freshen up after a day of touring and whatever else you're in the city for. The room I stayed in wasn't properly maintained and I guess a architecture flaw that the size of the bedroom is roughly the size of the rest room. The rooms could have been more spacious if they maximized the space from the rest room. Staff didn't clean the room first. You have some cobwebs on some parts of the room. The living room has lots of mosquitoes during night time. The place is clean, the staff is nice but they do not speak much english. Breakfast is nice. Good location being easy to find. But the sign board was too small or not attraction that made it hard to notice even though it was just near the street.